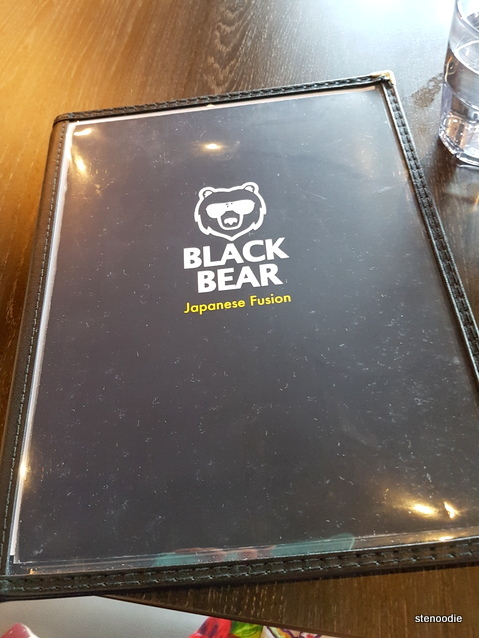 Last Friday evening, Ken and I checked out the new restaurant at Kennedy and Highway 7 called Black Bear Japanese Fusion. 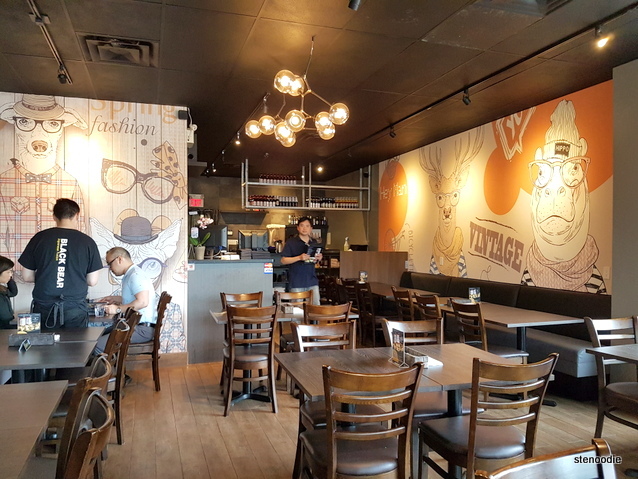 This Japanese fusion restaurant takes the place of a previous long-running Japanese sushi restaurant called Sushi on 7. 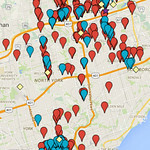 I still remember going there with my relatives many years ago when they were visiting Canada. 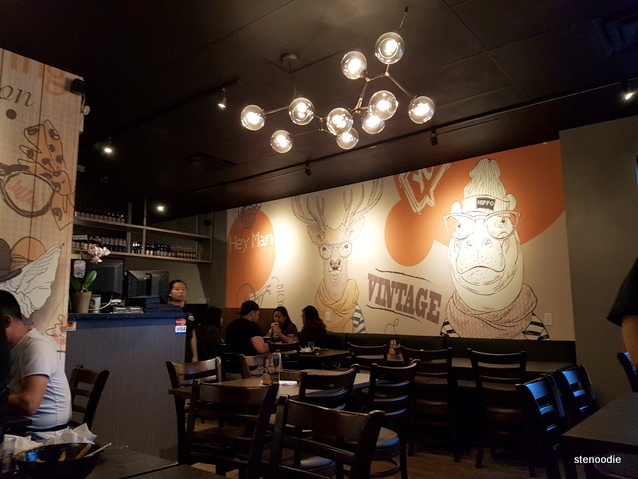 The inside of Black Bear Japanese is completely renovated with some cute and trendy looking animal characters on their walls. 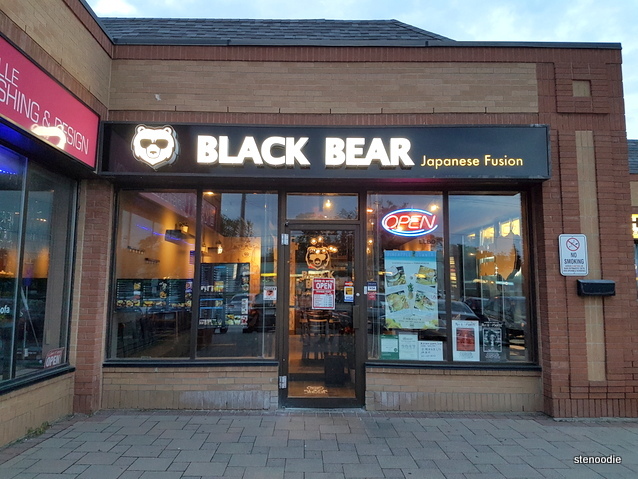 Their “black bear” mascot is also a cool-looking character with tinted sunglasses and appears as a light shining down on their entrance way too. When we arrived for dinner just before 7 p.m., there were only a few tables with customers there. We were able to pick any table to sit at and our server brought us the menu and water right away. During our time there, the rest of the tables were completely filled up and it seemed like this was a popular place for dinner for families, couples, or friends alike. I liked how throughout our visit there, the server constantly refilled our water glasses. I’ve never seen such diligent servers who refill water glasses so often! It was a great thing. 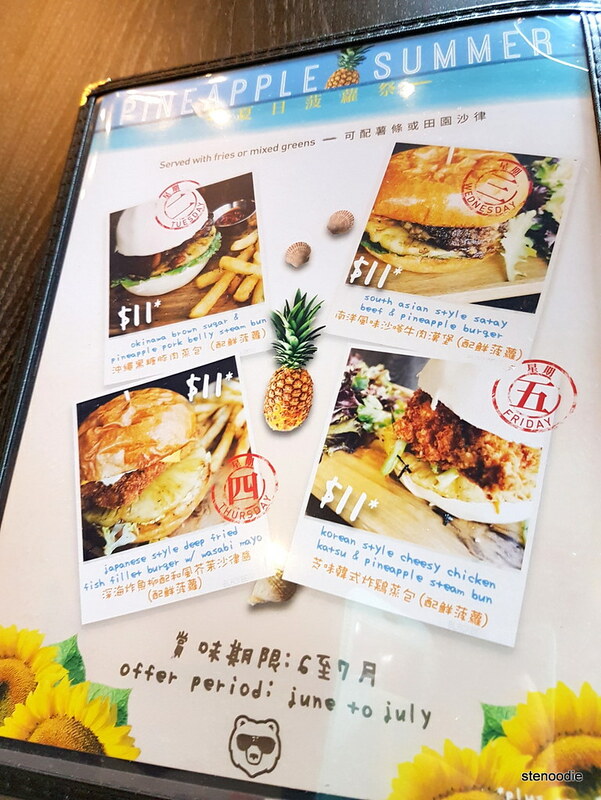 We ordered one item from the Pineapple Summer menu which consisted of different burgers for just $11 during each day of the weekday (except Mondays; they are closed on Mondays). 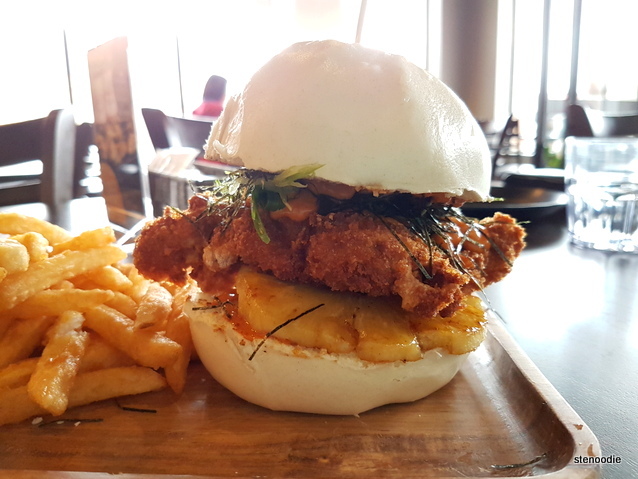 As it was a Friday, the “Korean Style Cheesy Chicken Katsu & Pineapple Steamed Bun” was the feature of the day. This came with a choice of fries or mixed greens. Ken chose the fries. 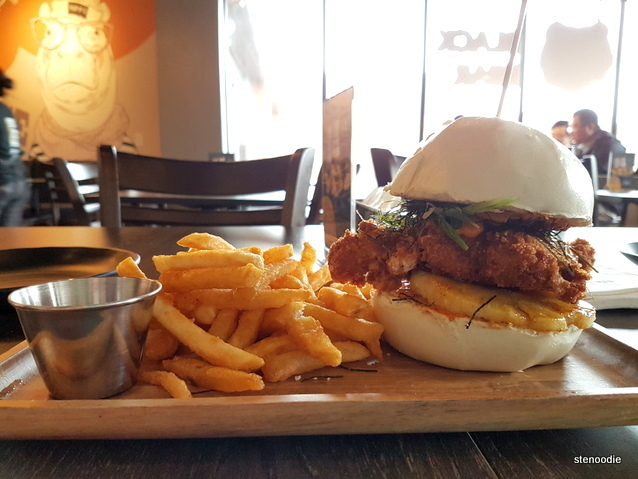 This turned out to be one of the cases where the food item looked good to eat and “photogenic” enough since it had a bright white bun as a burger bun — I’ve never seen that before — but unfortunately, the taste was a bit of a mix-up between good and bad. Really big piece of katsu chicken! 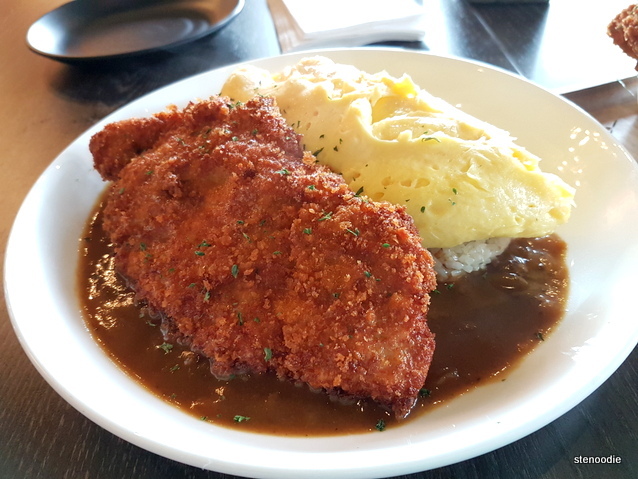 The other dish we ordered was the Katsu Curry Omelet Rice. 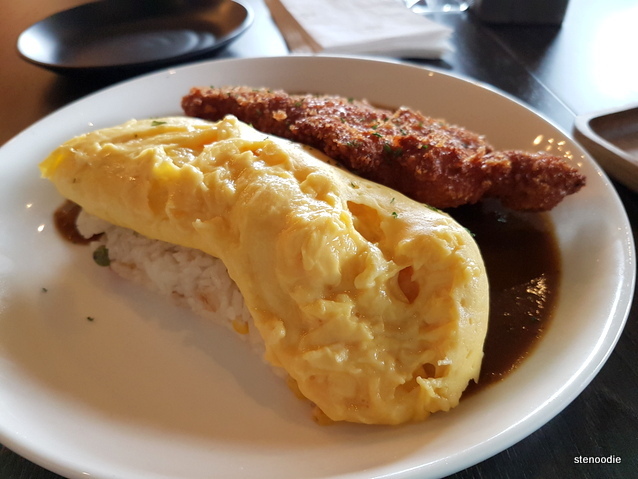 This was stir-fried rice topped with an omelet, dressed with in-house curry sauce, and served with deep fried chicken or pork cutlet. 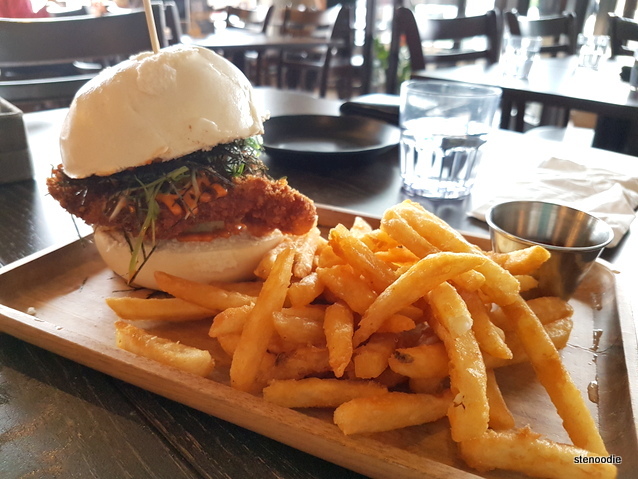 Since we were already enjoying the chicken burger, of course I chose the pork cutlet to try instead. This portion size of the curry omelet rice was good. I really liked the egg omelet; it was so fluffy and delicious! The in-house curry was also really tasty and was a good consistency. However, this dish fell short with the pork cutlet. The pork cutlet was probably a bit over-fried because I found that the pork cutlet was too hard and dense. 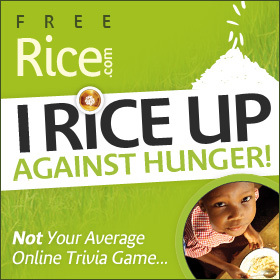 All in all though, it was a casual restaurant that was very comfortable to dine in. However, they have some work to do in terms of raising the consistency level of each dish to make sure that every ingredient maintains the same quality and taste all across the board. The rest of their menu contained many more Japanese fusion dishes that I might be interested in try if I find myself here again another time. This entry was posted in Food and tagged 4568 Highway 7 Unit 3, Black Bear Japanese Fusion, Black Bear Japanese Fusion menu, Black Bear Japanese Fusion white burger, food blog, foodie, fusion, Japanese, Katsu Curry Omelet Rice, Kennedy and Highway 7 restaurants, Korean Style Cheesy Chicken Katsu & Pineapple Steamed Bun, Markham, omelet rice, Pineapple Summer menu, restaurant review. Bookmark the permalink.